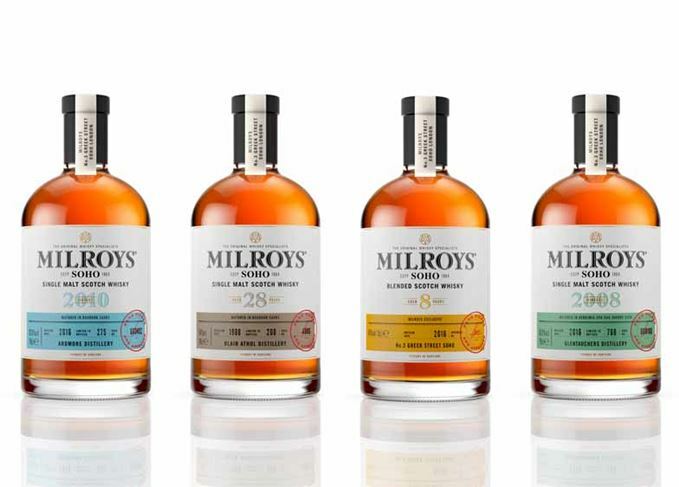 Milroy’s of Soho – reputedly London’s oldest whisky specialist – has launched four exclusive new whiskies to mark its first rebranding in more than 50 years. The shop in Greek Street, owned by Martyn Simpson since 2014, was founded by Jack and Wallace Milroy in 1964, and established a reputation as London’s leading whisky specialist. Now it has been rebranded by branding and design agency Good, launching three single cask single malts and one blend to mark the occasion. They include an 8-year-old blend, priced at about £29.95; Ardmore 2010 (£42.95), bottled this year from an ex-Bourbon cask, with 272 bottles available; Glentauchers 2008 (£52.95), bottled this year from an ex-Sherry cask, with 769 bottles available; and Blair Athol 1988 (£124.95), bottled this year from an ex-Bourbon cask, with 208 bottles available. ‘We’re really proud to put our names to these four brilliant whiskies, which are all distinguished and special in their own way,’ said Milroy’s CEO Martyn Simpson. The new whiskies will be available from the shop in Greek Street and from the Milroy’s website from 29 September. The Milroy’s rebranding also includes a new-look store and shopfront in Soho, a new website and new marketing materials. Two Black Bull bottlings, a double whammy from Blair Athol, a Glentauchers 6YO and a 42YO Tobermory. A selection of very youthful drams dominates this week, with whiskies from Ardbeg and Caol Ila.